American’s Cornerstone Strategy becomes more clear as they add flights to their cornerstone Airports (LAX, JFK, DFW, ORD, and MIA) and launch fare sales between some of these cities. American Airlines travel bookings can be made through AA.com. Fares are valid for round-trip travel to and from both Chicago and New York. The fares are nonrefundable and require a Saturday-night stay. A $150 change fee applies, as does the 9/11 Security Fee and PFCs (Passenger Facility Charges) of up to $4.50 per segment, depending on the airport. Fares shown do not include a Federal tax of $3.70 per domestic segment (defined as one takeoff and one landing), passenger facility charges of up to $18, and the September 11th Security Fee of $2.50 per enplanement at a US airport. Fare shown is each way based on roundtrip for economy class travel purchased on AA.com through Oct. 22, 2010. Travel is valid starting Jan. 5, 2011 with all travel completed by Feb. 25, 2011. American also announced promotional discount fares between New York and Miami, with fares as low as $79 each way, but you have to purchase your tickets by October 22, 2010. More details here. American Airlines and American Eagle have strengthened their commitment to Los Angeles with plans to add 10 new destinations – one international and nine domestic – for a total of 33 additional round trips beginning April, 5, 2011. I know several people that travel from Oklahoma City to Los Angeles on a frequent basis, and they’re already looking to getting the daily direct flight. 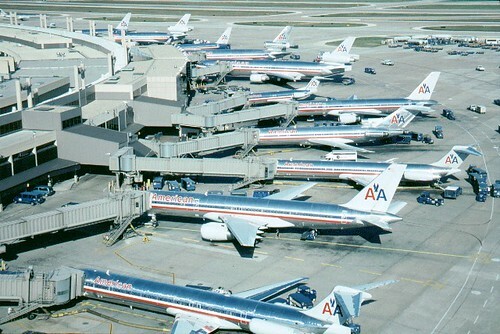 On a semi-related note, I found this photo gallery from USA Today: The aircraft and hubs of American Airlines.